within French Congo (see Congo [Brazzaville]). 10 Dec 1899 - 29 Dec 1903). 10 Dec 1899 - 29 Dec 1903 Haut-Oubangui province, within French Congo. 5 Sep 1900 - 11 Jun 1904 Haut-Chari region created within French Congo. 29 Dec 1903 Oubangui-Chari (Ubangi-Shari) colony. 27 Oct 1946 Oubangui-Chari overseas territory of France. (still part of AEF colony). 1 Dec 1958 Member state of the Communauté (French Community). Republic of Congo (to Jul 1960). 4 Dec 1976 - 21 Sep 1979 Central African Empire (Empire Centrafricain). ¹Full style 4 Dec 1976 - 20 Sep 1979: Empereur de Centrafrique ("Emperor of Central Africa"); description- Empereur de Centrafrique par la volonté du peuple Centrafricain, uni au sein du parti politique national, le MESAN ("Emperor of Central Africa by the will of the Central African people, united within the national political party, the MESAN"). Territorial Disputes: Periodic skirmishes over water and grazing rights among related pastoral populations along the border with southern Sudan persist. 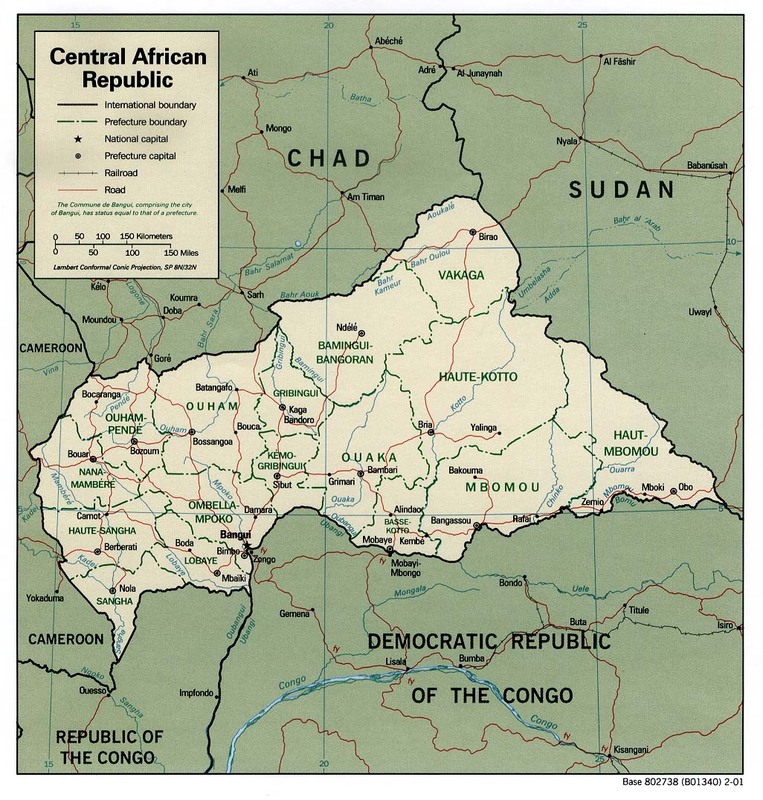 state in north-east Central African Republic at Kaga-Bandoro. by the Congo Free State. 14 Aug 1894 Franco-Congolese border treaty. 25 Feb 1895 End of Congo Free State administration.